Growing up my family made sure to have one ornament on the Christmas tree from each year that actually specified the year on it, so you could remember what year it was from. Sometimes these related to events or travels. 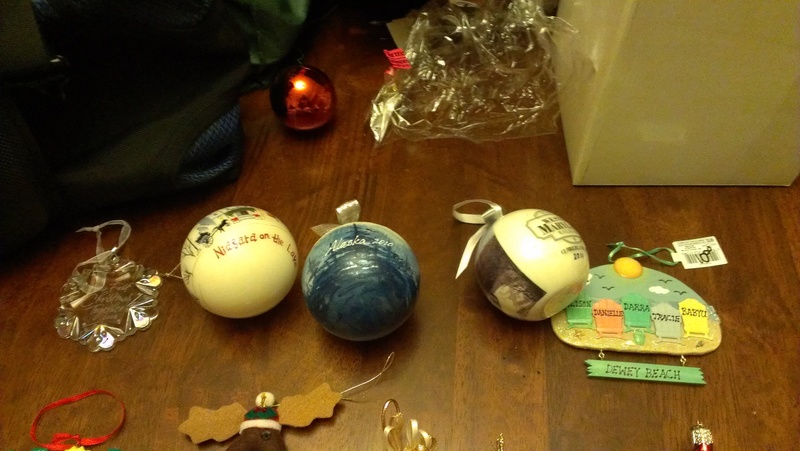 Other years were represented by homemade ornaments my sister or I made in school. Once I got married and my husband I started putting up a Christmas tree together I decided I wanted to continue the tradition. 2008 – Our First Christmas Together This once is probably self-explanatory. It’s the year we got married. 2009 – Niagara on the Lake. My sister was in a wedding in Buffalo, which my parents were also invited to. My husband and I tagged along to babysit our niece while everyone else was at the wedding and then the whole family took a trip up into Canada to Niagara Falls. We also toured several wineries in Niagara on the Lake. There was a Christmas shop in their little downtown area where I picked up this ornament. 2010 – Alaska. My husband I went on a cruise to Alaska in May of 2010. It was an amazing trip. If you ever have the chance to go I highly recommend it. 2011 – Western Maryland Scenic Railroad – Every year the Maryland Library Association has a silent auction at their annual conference. Many of the state library systems get local businesses to contribute gift certificates and other items from the region to create baskets that people can bid on. I bid on, and won a basket put together by the Western Maryland Regional Library, which included a variety of gift certificates for a weekend away in Western Maryland including a bike rental to ride on the bike trail out there, a gift certificate for a hotel stay, and a ride on the Western Maryland Scenic Railroad. I picked this ornament up on that trip. 2012 – Pulling out the ornaments from this year I thought I had a 2012 ornament relevant to my family, but I don’t. The only one I have is the one I bought on my girls’ weekend in Dewey Beach, DE. Oh well. I’ll have to be better about it next year. Most of the rest of the tree is just generic ornaments, but I’m slowly collecting some other special ones in addition to the annual ones. I like getting ornaments as souvenirs when I’m traveling if possible because I know they’re something I will use again unlike many other souvenirs and then I get to relive my fun travel memories every year when I decorate my tree. These are the ones I have so far. 1. Seashell ornament from Roatan, Honduras, which I got on a cruise we went on for our friends’ wedding. 2. Gourd oranament. There’s actually a little nativity carved inside of it, which you can’t see because of the way the ornament flipped when I was taking the picture. I got this when I was in San Diego for the ALA Midwinter conference a few years ago. 3. A Flamingo ornament from HonTown, which is a store in my neighborhood selling kitschy Baltimore stuff. Thanks to John Waters’ film Pink Flamingos, which was filmed in my little part of Baltimore we’re into the pink flamingos around these parts. 4. The Olivia ornament is from my niece Katelyn. My sister and her family came to our house for Thanksgiving last year. We went the Saturday after to pick out a tree from Valley View Farms, where we get our tree from every year. They turn the whole place into a giant Christmas shop this time of year with hundreds of ornaments to choose from. My sister had my niece pick one out to put on our tree. She went with Olivia. 5. The Just Married Disney ornament was given to us by some friends who took a trip to Disney either shortly before or shortly after we got married. I can’t remember which. 6. The wedding bears ornament is from St. Maarten, which is where we went on our honeymoon. 7. The moose in a canoe ornament is also from Alaska. I picked it out at a store in Anchorage as one of my Alaska souvenirs. I came across the one with the date on it later in the trip, so I actually came home with two ornaments from that vacation. We went to Disney right before you got married – in September. Funny that we flew to Florida twice within 2 months! 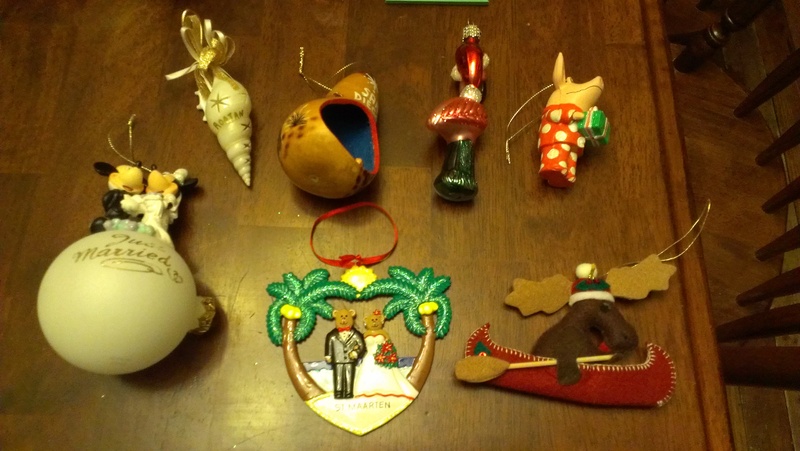 I missed putting up the dated ornaments this year because most of them are still back in Florida. Next year! I loved reading about your ornaments.